A screen grab from CSUN’s website. Click above to visit the CSUN U-pass site. A pilot program to streamline and reduce the cost and hassle of purchasing college student discount transit passes was launched this week by Metro and California State University, Northridge (CSUN). U-Pass is also scheduled to be rolled out at five other colleges this fall: Pasadena City College and Rio Hondo College on August 22, Los Angeles Trade Technical College on Aug. 29 and American Career College and West Coast University on October 15. The Universal College Student Fare Program (U-Pass) makes it easier for students to receive discounts without a lengthy application process and waiting period. In one sentence: U-Pass may be cheaper than Metro’s college monthly passes and a special sticker enables your student ID card to become a TAP card needed to board buses and trains. A regular Metro monthly pass costs $100 compared to $43 for a monthly College/Vocational TAP pass. With U-Pass, students purchase transit directly from their university and, in some cases, the college subsidizes the fare. For example, CSUN charges students $95 for 21 weeks of transit, a 64 percent discount from the College/Vocational student fare. U-Pass participants receive a “smart sticker” with an embedded TAP computer chip that is affixed to a student identification card. The U-Pass can be re-loaded during the registration process every semester the student is taking classes. Schools eligible to participate in the program include the Los Angeles Community College District, California State Universities, University of California, private universities and vocational colleges. There are 1.4 million public college students in L.A. County and currently only 14,000 students (1 percent) participate in reduced fare programs. Metro is planning to expand the U-Pass program after the fall semester. For more information on the program go to metro.net/riding/colleges. •Many college/vocational students are eligible for the $43 month college pass. Click here to apply. 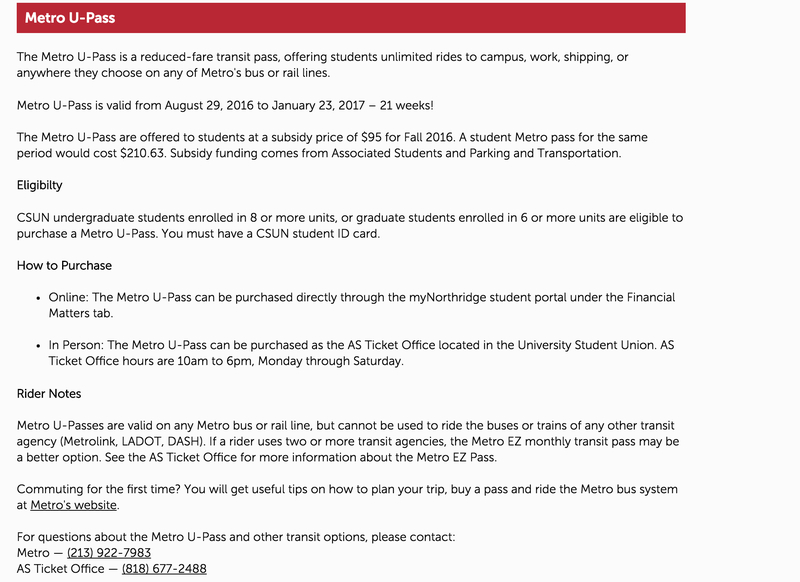 •There are other colleges not yet part of U-Pass that are selling Metro college passes to students — such as UCLA, where passes cost $55 to $65 per quarter. Santa Monica College also has a deal allowing students to ride Big Blue Bus, which connects with Metro’s Expo Line. Hi. This question may not be entirely related, but I want to know why EZ passes cannot be purchased at a TVM. Thanks! Good questions and I don’t even know enough to make up a half-baked answer 🙂 Let me run it up the flagpole with the TAP folks. Thanks Steve! Interesting to know. Online EZ pass loading works fine, but I also like the “instant” feature of a TVM.